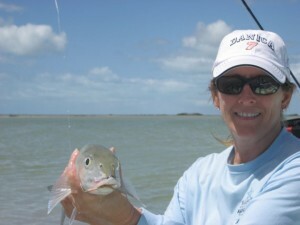 The folks at Deneki are hosting a bonefishing school for women down at Andros South. At the school will be Kara Armano and Bruce Chard, as well as the guides and good folk at Andros South. Building on the success of our very popular Bonefishing School program, our Women’s School will be co-hosted by Kara Armano and Bruce Chard. You’ll get hands-on instruction from the best in the business, plenty of time on the legendary flats of Andros Island, and the company of a bunch of women who love fishing as much as you do – what could be better? Now, I think my future Mrs. Bonefishonthebrain might not be totally set for this just yet and won’t have the vacation time anyway, but man… how fantastic would it be for her to have a safe and supportive place to connect with the flats and the fish that live there? I’ve been to Andros South and it is still a place I keep close to my heart/soul. The wildness of the place and the beauty of the countryside are really mind-numbing. Hope it fills up and creates some lasting impressions. Andros South, for the ladies. Sadly, I didn’t have the budget to fly to Abaco and fish with Buddy, but he did manage to get me the answers to my questions through his wife Cindy. Thanks for that! As a guide in Abaco, what is it that makes Abaco different from other Bahamian islands? 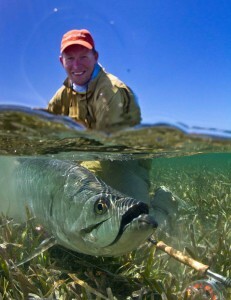 The marls world-class fishing. There is no other fishery quite like it. When did you get your first fly rod and do you remember what it was? I got my first fly rod in the early 90’s. It was a 10wt Fenwick. It was given to me by my second client. He brought if for me the second year he came back to fish with me. That rod led to my passion for fly fishing. The first rod I actually bought for myself was a two piece 8wt Sage RPLX that I still have in my rod collection. When you are on the water a lot you see some interesting things. What’s the strangest thing you’ve seen out on the flats? A pod of dolphins in less than two feet of water out in the marls about 20 miles from open water. That’s not where you’d expect to see something so big because they are half out of water as they are swimming. What is something that you think every angler should bring along with them to Abaco that many don’t? Every angler should have a relatively new fly line on their reel and bring a spare line along with them too. Nothing casts quiet as good or quite as far as a new line! I have one client that fishes with a 20 year old line. He’d be amazed what a new line would do but no matter how many times I tell him that he keeps coming back with the same old line. What would you say is the biggest threat to Abaco in terms of bonefishing (netting, development, pollution)? Because of the popularity of bonefishing and the increased numbers of visitors to Abaco overfishing is probably the biggest threat to bonefishing here. What is something you really love about Abaco that is non-fishing? One of the things that I love about Abaco is that it is still sparsley populated so it’s a very peaceful place to live. We only have one traffic light on Abaco so there aren’t any rush hour traffic reports here yet. Plus the water is stunning to see. Just looking at it can raise your spirits and relax you. What is your favorite rod/reel for bonefishing? I’ve fished with a lot of great equpiment over the years. 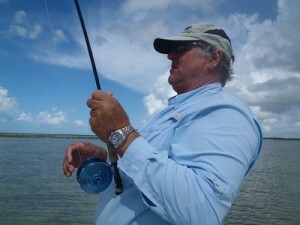 My favorite reel is the Tibor Everglades that was given to me by a client many years ago. I have a room full of rods and I still use a lot of them. I even had my own signature rods built a few years ago which are great casting rods. But I’d have to say my favorite rod is the 8 wt Orvis T3 because it is a very stiff fast rod that casts great in strong winds. Interestingly enough that rod was also a gift from a client. You may have realized by now that I have had a lot of pretty special clients over the years. 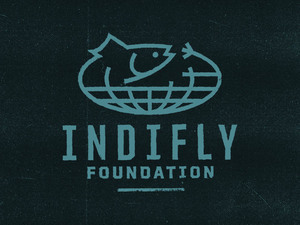 If an angler were going to bring just one fly with them in different sizes and weights, what would that fly be? Probably the best all around fly would be a Gotcha tied on a size 4 hook with either lead eyes or bead chain eyes. 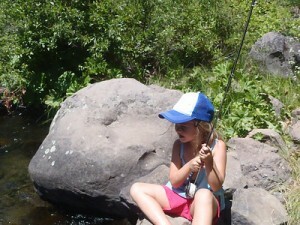 I went camping and fishing with my little girl. It was my fiancee’s bachelorette weekend and that meant some time with just the 5 year old any myself. 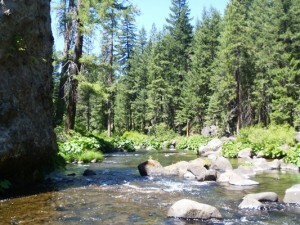 We went up to the Upper McCloud River, at the foot of Mount Shasta, about 5 hours from San Jose. For those of you in NYC or Florida, this kind of California may surprise you. It is a deep, dark green with towering trees. Flowing through this dark and pervasive wilderness green are several extremely fishable rivers. This was my destination. We got up to the campground on Saturday morning, grabbed one of the last two spots and quickly set up camp. My 5 year old was immediately enamored with a 6 year old boy across from us, which I fear foreshadows a certain amount of trouble come the teen years. Eventually, I threatened her into convinced her it was time to go fishing. We got down to the water quickly and on the 2nd or 3rd cast I was hooked up. She got to fight the fish and then touch it. I asked her if she wanted to kiss the fish and she said yes. So, she did. This, when I asked later that night what her favorite part of the day was, proved to be her favorite incident of Saturday. All told she says she kissed three fish that day. She also told the neighbors that I caught “one million two” fish. None of this hurt my feelings. ABS with her trout. Love it. My folks came for dinner and that meant I got to hit the water with my dad between dinner and smores. In the two little stints of fishing I had I don’t know how many fish I caught, but it was a lot… maybe 40. Turns out they had just stocked the river with truck trout. I don’t really go places to fish for hatchery fish as I love wild fish over human-raised fish, really regardless of size. Still, “the tug is the drug” and I can’t complain. 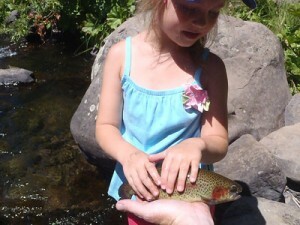 A few special moments were created on and around the waters of the Upper McCloud. Water has a way of doing that. Just a girl and her trout. Once the sun came off the water, ze brownz starting poking about. One of the things learned by fishing with a 5 year old is that the line between “we are having a great time” and “I… (sob, sob) want to go back to the camp ground… (sob, sob)… NOW!” is a perilously thin line, easily crossed with no warning or explanation. There is a fair bit of balancing between pure joy and pure frustration, but I guess life is like that to one degree or another. I urge all the parents out there to get their kids out on the water. 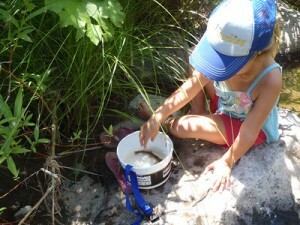 Let them kiss a fish and watch it in a bucket and hold the rod and take credit for landing it. Turn over rocks and show then the bugs and talk about the trees and the flowers and the plants. Don’t forget your daughters. Happy fishing all. Now, I’ve come up with my own work around to get my rods from Point A (bonefishless place) to Point B (bonefishful place). It is very practical, but not very attractive. It involves a soccer sock and some REI straps. 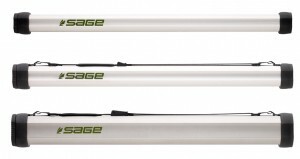 Well, looks like Sage has just come out with a new traveling rod case. Hmmmmmm…. I think I just lost the style war. Watch for them to show up at Sage. PS – I see the word “bookmarks” at the top of the page when published, but not on the edit screen. I have no idea what that is there for. Local papers sometimes run stories about folks from their area having great travel experiences. With a Google Alert set for bonefishy news, I sometimes see these stories come in through my in-box. This story is interesting because it isn’t your normal trip. It is actually one of the Destination X trips from Angling Destinations. Because of that, we won’t get to know exactly where they were, but it sounds interesting. One of the best parts of the story is that the main protagonist’s name is “Killar” which sounds like a pretty hard-core prison nickname. Ten fish is a good day of bonefishing, and each of the guys had more than 10 in the first couple of hours. Killar said the fish he caught averaged more than 6 pounds — including a 10-pounder. 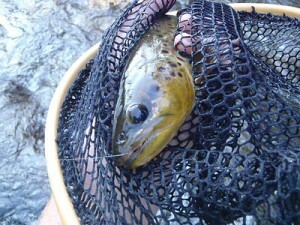 No one has ever cared about how many trout I got to eat in a day. You don’t count the number of trout you get to jump. The reason that no one talks about those things is because they are pretty trivial. If you get a trout to eat, it is likely going to get hooked and if you get it hooked… well… odds are good that it is going to be landed. Tarpon fishing is different. It is an accomplishment if you can get one of those massive, per-historic piscatorial wonders to eat. If you get it mostly right and you get a little lucky, you’ll get one to leap out of water in a cartwheeling, frenetic explosion. Only when it all comes together, when you do what you need to do and you have luck on your side do you get to see the whole thing through to completion and hold that fish in your hands and look into it’s bottomless eye and feel the coarseness of its mouth and then see it swim away, maybe coming up to gulp some air before it continues on its migration. That’s why people care about the fish you fed, the fish you jumped and the fish you landed. It is all hard and unlikely and intoxicating and so, so, so much fun. That’s a very real smile. They guys over at Skinny Water Culture continue to do strong, strong work. I’m a fan and have been since I first found them a few years back. I’ve seen more and more folks in their gear. I even saw a guy in a hotel in Cuba wearing a SWC shirt. Nice to see good things happening to good people. 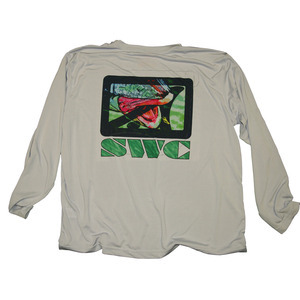 You can find this bonefish microfiber shirt here. Yup, I have this one too. 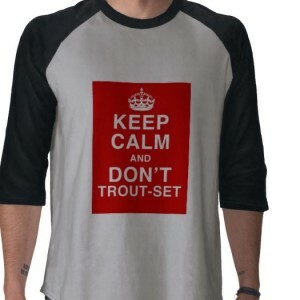 Matt over at the blog 411#3 has a series of shirts soon to be available based on his 4 tenants of saltwater fly fishing. These certainly do ring true for me and I’ll be getting one of these in the not too distant future. The days are in single digits and I’m starting to get really annoying on the whole “Guess where I’m going? !” thing. 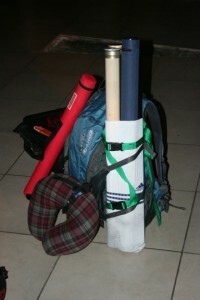 The media tour with Yellow Dog and Avalon is fast approaching and my rods are finally all here. This is what’s on tap. That’s a pretty sweet line up. The only thing I don’t really have in there is a dedicated permit rod, but that’s because I hope I find more time casting to baby tarpon and not-baby bonefish than searching for permit. I just can’t help it… that’s how I feel. Don’t hate me. These are not my rods, of course. 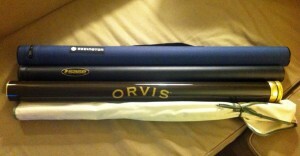 The sad day when I get back will be returning these rods to their corporate parents. I hope to get a sense of where the new Sage One stacks up to one of my favorite rods, the Helios. The Predator is a good, workman rod that is the low-cost rod of the bunch. The prototype? I’ve never cast a prototype before. Basically… I’ll keep you posted and I. CAN’T. WAIT. Well… guides can really make this look easy. 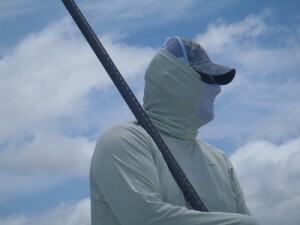 Here we have a guide in Andros make a backhand cast in some decent wind and hookup pretty much instantly. Sure made that look easy.